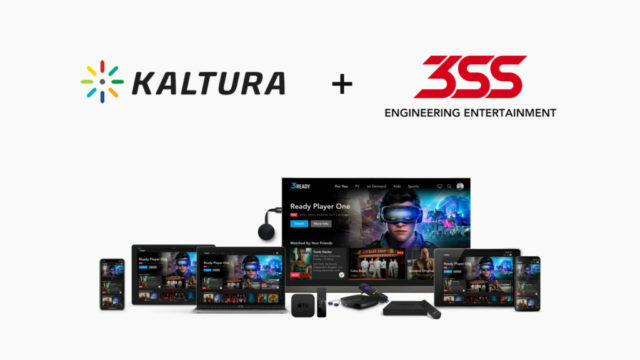 Kaltura and 3 Screen Solutions (3SS) have partnered on a new solution designed to let operators launch targeted and personalised cloud TV services. The offering brings together Kaltura’s Cloud TV platform and its machine learning-enabled Targeted TV technology with 3SS’s 3READY front-end, which includes an adaptable user interface and user experience. The pre-integrated offering is designed to help content owners, broadcasters and network operators to quickly launch customised, branded IPTV and OTT multiscreen services. These services can be monetised by a combination of ads, subscriptions and transactional payments and content can be promoted via the home screen, content recommendations and search suggestions. “We are excited to bring together our Targeted TV offering with the innovative 3READY solution from our partner 3SS,” said Shay David, Kaltura’s Co-founder, President and General Manager of Media and Telecom. Kaltura and 3SS are debuting their joint solution at NAB in Las Vegas this week, with demos available at the Kaltura stand, SU7110.